Shivkumar Patil is a resident of Solapur, Maharashtra and was born sighted into a poor family. At the age of 4 years he was affected by a retina related eye disease. Although his parents sought treatment at various hospitals for him, they had to endure with a complete vision loss. He was put in a nearby blind school in Solapur with a residential facility. He studied in the blind school till he completed his 10th standard. Lack of cooperation from school and inadequate study material made his education a difficult aspiration by the time he finished Class 10th. Thus, he decided to give up on education and instead look for employment. 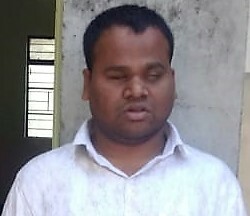 For this he joined a vocational training program in National Association for the Blind (NAB), Mumbai in 2013 and later a computer course in Pune in 2015. Neither finding any employment nor able to afford accommodation in the city he came back to Solapur. He enrolled into higher secondary school through Open University and stayed at NAB, Solapur hostel. He also kept looking for various government jobs at the same time but his qualifications were inadequate for majority of the jobs. He heard about Eyeway on the radio and contacted the Helpdesk in 2017. He has been in frequent contact since then and benefitted much from his interaction with our counselor. He had various queries pertaining to concessions for visually impaired, UDID card, and vacancies for government jobs. He was in pursuit of a quick fix to many of his problems like poverty, disability dependence etc., and he believed employment was the best solution. But the Eyeway counselor motivated him to pursue his education so a wider range of opportunities would open up for him with better qualifications. This consistent encouragement made him to pursue graduation after finishing school. This was a significant transition in Shivkumar’s life – someone who thought there is no place for him in this world started to aspire for the best. He joined graduation through open schooling from Yashavantrao Chavhan Maharashtra Open University (YCMOU), Nashik. After his first year annual exams he failed in a paper and he wanted to make use of the provision of 3% grace marks for visually impaired allowed by the State Board to obtain a pass result. He contacted Eyeway for help. Our counselor provided Shivkumar with the government resolution citing the provision of grace marks and asked him to submit an appeal with the University office. After some delay and another visit to clarify the matter, his result was finally modified. While we helped resolve his immediate problem, Eyeway also encouraged Shivkumar to study hard so that he doesn’t have to rely on such provisions in the future. And to assist him with the study material, our counselor apprised him of Bookshare, an online accessible library and assistive apps like the Simply Reading app. Shivkumar was also put in touch with a representative of Bookshare for any further assistance. He has signed up for a membership of the online library to access relevant course books.